A beam, Simply Supported Beam : U.D.L. 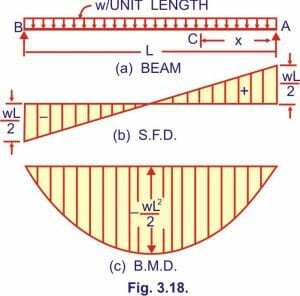 over the whole span is a structural element that primarily resists loads applied laterally to the beam’s axis. Its mode of deflection is primarily by bending. Structural loads or actions are forces, deformations, or accelerations applied to a structure or its components. Loads cause stresses, deformations, and displacements in structures. Assessment of their effects is carried out by the methods of structural analysis. Excess load or overloading may cause structural failure, and hence such possibility should be either considered in the design or strictly controlled.